For the past several years, the Fantasy, Futuristic, & Paranormal Romance Writers (a specialized branch of Romance Writers of America) have held the Prism Awards for published authors. In categories ranging from Dark Paranormal to Young Adult to Time/Travel Steampunk, the awards are becoming more and more prestigious in the romance and fantasy communities. Past winners include authors such as P.C. Cast, Cynthia Eden, Kerrelyn Sparks, and Jeri Smith-Ready, among others. 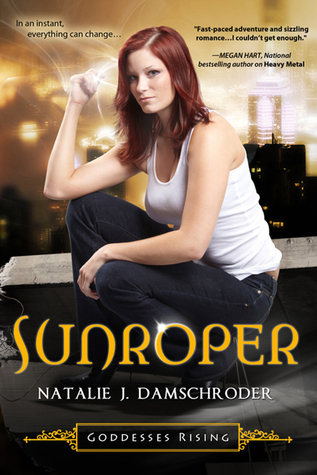 I was lucky enough to get to work with Natalie on the second (Heavy Metal) and third (Sunroper) books in this series, and her dedication, passion, and ambition to make her stories the best they can be is impressive, to say the least. Not only does she have a super creative brain but she was always ready to put her blood, sweat, and tears into her revisions. I’m so happy to hear that these super fun and entertaining books are getting the recognition they deserve! Sunroper can be read as a standalone, though, I would definitely suggest starting with book one, Under the Moon, to really get the full Goddess experience. Marley Canton is done being a victim. A year and a half has passed since she discovered her ability to nullify power in those who aren’t supposed to have it. She’s now on a quest not only to stop the brats who’ve become addicted to goddess power, but also to find the source of their addiction. Like Marley, Gage Samargo is tracking down the goddess who went rogue decades ago. Insane with too much power from the sun, she’s selling that energy to Gage’s younger brother and his friends, who are no longer content to come into power naturally. While they work to find a way to neutralize the goddess, Marley discovers that every time she nullifies someone, she takes on some of the goddess’s insanity. Gage falls for Marley’s sharp wit and intense desire to right wrongs. But once he discovers she’s turning into her enemy, is it too late to back away? I have my fingers (and toes) crossed for you! Oh my gosh, thank you for saying such nice things! When I first wrote Sunroper, I was suffering burnout and brain fatigue, and I didn’t know how to fix what needed fixing. You are so smart, so gifted at seeing not only what the author’s vision is, but where she failed to achieve it and what needs to be done to get it there. It was a huge pleasure working with you, and this recognition is as much yours as it is mine.